Bohemian Waxwings are one of the most beautiful birds to visit Alberta in winter. The waxwing has a gray body, yellow tipped tail, rufous under tail coverts, and yellow and white wing tipped feathers. Theses waxwings can be found in large flocks, eating mountain ash berries and crabapples. The Red-breasted Nuthatch is a very pretty little bird which can be found through coniferous and mixed woods. The breast is red, with a gray back, a white eyebrow, a black eye-line and a characteristic that all nuthatches share, an upturned bill. 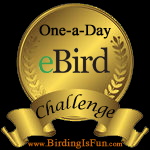 This entry was posted in Alberta Birds, General Birding, Must-see birds, Winter, Year List and tagged Bohemian Waxwing, Must-see Birds February, Nuthatch, Red-breasted Nuthatch, Waxwing. Bookmark the permalink. These are beautiful birds to look for in February PrairieBirder, the little Red-breasted Nuthatch looks great against the snow and the Waxwing is lovely in amongst the berries! 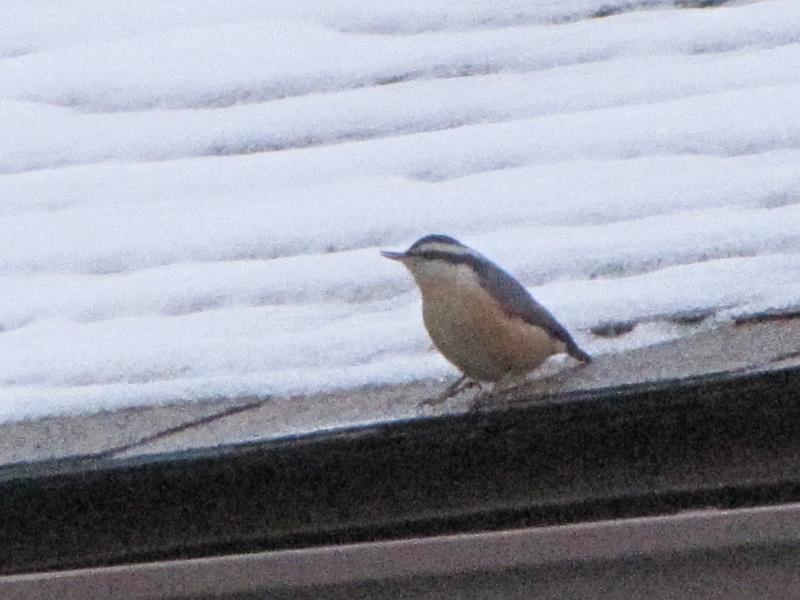 The nuthatch photo came out a bit fuzzy, but thats ok. Thank you very much Mia for such a kind comment. I agree Bohemian Waxwings are beautiful birds. I have a non-birding friend who was so surprised that such a beautiful, colourful bird was here Western Canada (she is in Medicine Hat). I guess she thought all we have are drab little sparrows. I’ve since made a point of educating her on birds she might see on walks around her city. I haven’t seen a Boh Waxwing in my part of SK in a couple of years. Thank you for the very nice comment Kathy. I hope you see Bohemian Waxwings soon. Super birds. I have yet to see a Bohemian, and count myself lucky if I get a Red Breasted Nuthatch, but I love to watch them. Nice photos too. I hope you see the waxwings and the nuthatches soon Dan. What a pleasure it’s been to come down from Yellowknife to visit my sister in Winnipeg. In the last two days we’ve seen a flock of Bohemian Waxwings and a Great Horned owl … IN HER BACKYARD!!! Last night, the Great Horned was sitting on a tree not 40 feet from the sunroom. It showed up shortly after midnight.. a weird coincidence perhaps because my sister has one of those clocks that makes bird sounds on the hour and the sound for midnight is the great horned owl. 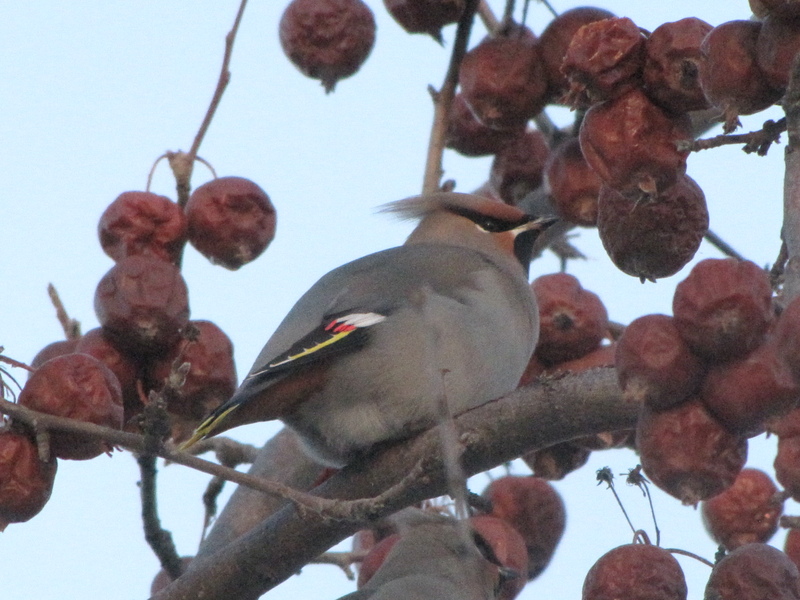 Then today a huge flock of Bohemian waxwings returned to feed on her crab apple tree. At first we thought they were cedar waxwings, but then could make out the rusty underwing. Beautiful! !